Channel effortless style in Marina Rinaldi’s long line knife pleated skirt. In subtly shimmering lamé jersey, it’s a versatile and elegant piece. 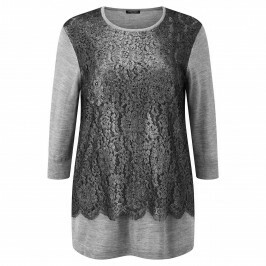 Team with a plain white t-shirt for the daytime or a silver lace tunic for the evening. Silver sheen, knife pleated maxi skirt. Elasticated waist band. 85% Viscose, 15% Polyester. Lining: 100% Polyamide. Dry Clean Only.